100-Day Challenge, Day 27. Talk -or read – yourself into success. ≈ Comments Off on 100-Day Challenge, Day 27. Talk -or read – yourself into success. affirmations, brexit, grenfell, mission, Stephen R Covey"
I have never really been all that enthusiastic about affirmations, those sentences one states (ideally out loud) to oneself that are intended to reinforce the cognitive integrity between what we say to ourselves and how we behave. Not that I don’t believe that what we say to us influences us, but the woowaah suggestion that doing so out loud makes any difference. Until this week. Until last week, I had got into the habit of reading my PMS daily – it was on my to-do list and the brevity of time it took, allied to the simplicity of the particular to-do, meant it was an easy ‘tick-off’ in my planner. I didn’t shout out loud (partly because I was in an office full of personal development sceptics, aka ‘detectives’), but I did focus on the reading. And for the couple of weeks I did that I lost weight, produced, and lived according to said PMS. This week, I did not. I allowed myself to believe that I had, by now, ‘got it’ and didn’t need to read it any more. This was the week I didn’t exercise, ate too much (and it doesn’t take ‘too much’ to stop weight loss, I assure you), and didn’t study for my forthcoming test as well as I could have. In other words, my failure to read my PMS influenced – well, my failures. So it is back in the planner and will be read daily this week. And I respect affirmations a little bit more than I used to. And to be frank, if they are good enough for Stephen Covey, then they are certainly good enough for me. Now, dear sceptics – you may think this silly. Now ask Lewis Hamilton, Tiger Woods, many premiership footballers, and copious other successes who you’ve SEEN talking to themselves or meditating with closed eyes just before they perform, what they are doing. And if it is good enough for the successful – why isn’t it good enough for YOU? Don’t learn TOO much. Find ‘The Way’ that works, then ignore alternatives. ≈ Comments Off on Don’t learn TOO much. Find ‘The Way’ that works, then ignore alternatives. I attended a talk last Monday by an excellent speaker, Jamie Denyer, whose presentation included a sobering observation. Once I got past his odd clothing choice – a bit hip-hop for a grandfather living in Swansea – I really enjoyed all of his talk, except that sobering bit. The sobering bit thrown right at me, personally. At least, I thought it was personal. I thought it was personal because the cap did fit and I had to wear it. 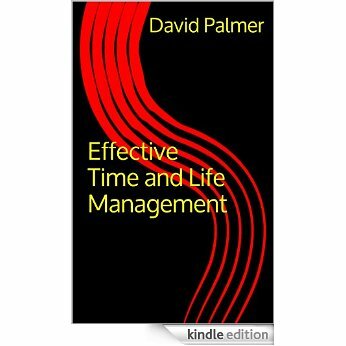 He described the individual who buys a personal development book, avidly reads it to the last page, then puts it down and “waits for the magic to work.” Then, when it doesn’t work because they aren’t applying it in a disciplined fashion they go out and buy the next one – and repeat. Then they repeat ad nauseum. He said that this is referred to in the trade as ‘shelf-development’, in that your book shelf gets fitter by holding up all your books. Ouch. You should see my collection. When I give talks on self-leadership (yes, fraudulently to some degree), one of the things I tell people is this. Apply the content religiously and don’t buy any other book! There is a personal reason that I do this. I will sit there and read one of my books. I will then think, “This is the system I will now apply.” I will then see another book, listen to another trainer, see a new form, or just have something come to mind when I am walking the dog, and I start to think about how I will apply that instead of what I was already (supposedly) doing. As a result, instead of ‘doing’ I am perpetually ‘thinking about doing’. The daft thing is – and Stephen Covey wrote about this in The 8th Habit – they are all saying the same thing. They ALL say that taking responsibility for our thoughts is the key to a directed, patient, principled life. They ALL say that having goals and a sense of direction towards a passion is key to a successful life. They ALL say that relationships are important. They ALL say that looking after your body enables success in the former three endeavours. BUT they all have subtly nuanced alternatives to how to apply the philosophy to the discovery of a purpose and how to define goals. I have suggested before that success is created by application of self to a simple philosophy. Communicate with clarity – in and out. After that, it’s all about method, system and practices. For me, I always come back to Covey’s template because I understand it so well, teach it in schools, and absolutely believe in the systematic approach and principled teaching that it is. You could choose Canfield’s, Robbins’, Ziglars, Hobbs – whoever you like. But just pick one. It leaves the mind clear for the important stuff. Then apply it with discipline. Don’t just be interested – be QUALIFIED. ≈ Comments Off on Don’t just be interested – be QUALIFIED. I am now involved in the provision of a new Third Resolution ‘service’, having qualified (a loose term) as an Institute of Advanced Motorists Local Observer. This means I get to tell other people, with a level of authority, what I think of their driving. That is something I missed from my days as a uniformed copper. Although unlike then, those people will have paid to be told and they won’t argue (much) about my being right. Yesterday, I attended a training session and was slightly taken aback to learn that for every 100 people who start training as advanced drivers, as many as 60% plus elect NOT to take the test at the end of the programme. Just as we say ‘You’ll pass the test!’, they decide that they don’t want to be tested. They’re good enough, the ‘authority’ tells them so, and they demur. This is not like school, where you take an exam at the end of a school year, ready or not. These are people who have been prepared for, and told they can pass. And I am astounded. I have spent my entire life testing myself against higher standards. I have sought out education and gained qualifications. Occasionally I have failed, only to revisit that failure and again take on that challenge, only to succeed. That doesn’t mean I am ecstatic when I approach an exam or assessment. I am nervous about the result. But I welcome the challenge because if I come through, I have proved to myself I am better than I was before. So when I read that ‘our children are being stressed out through tests’ I think to myself, “Why are we telling our children to fear assessment? What numpty decided that being properly prepared for the challenges that will face us can only be overcome when they face us, and that we should not test ourselves in anticipation of that test. Fortunately – and here’s the paradox – not one of us would want to be diagnosed by an unqualified doctor, have our accounts done by someone who can’t prove they are qualified (or at least have a Maths GCSE), or use a Uber driver who hasn’t passed his driving test. We absolutely insist that those who provide our services are qualified – trained and assessed – to do so. And yet some twits have decided that asking a teenager to take an exam in a peaceful, quiet room is stressful. Life is a test. It tests our ability to cope, it tests our ability to overcome, it tests our ability to live a life of meaning. It wants us to be better, to find something about which we can be passionate. Getting trained and independently assessed in those areas about which we are passionate and which serve our sense of meaning is a discipline (First Resolution), provides competence and builds our character (Second Resolution), and inevitably encourages us to start providing excellence in service when we manifest our training through employment or hobbies (Third Resolution). And if your training and assessment is connected to your vision/mission/purpose – what the hell is there to get stressed about? This week I encourage all readers to identify a mission- or passion-related qualification and go and sign up for the course that will demonstrate to others that you aren’t just interested – you are qualified. 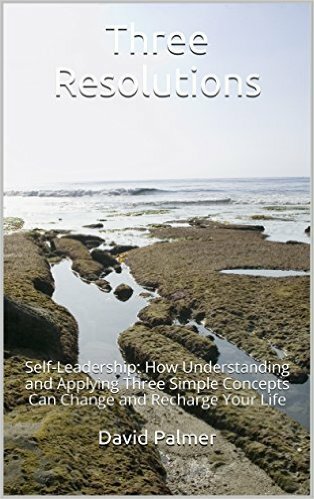 For more on The Three Resolutions, go HERE to Amazon to get the Kindle version of the book, or HERE for a Paperback edition. Start a New Revolution. One called Standards Matter. ≈ Comments Off on Start a New Revolution. One called Standards Matter. What is ‘competence’? Webster’s Dictionary describes it as ‘the quality of being capable, sufficiency, capacity’; Wikipedia goes further and says it means (among other biological and scientific definitions) ‘Competence is the ability of an individual to do a job properly’. And there’s the rub. Using the Human Resources, work orientated definition of competence is something I made the error of doing in my two editions of The Three Resolutions, a mistake I intend to correct in the 3rd Edition. Not because that definition is incorrect, but because its application solely in respect of ‘work’ is far too narrow. Competence is applicable to more than work – it’s applicable to all areas of life. Those who now me will be well aware that I can be spectacularly pedantic about things like English Grammar, driving standards, and the way people speak. There are two reasons for this. As someone who believes that we can choose differently I therefore detest unthinking compliance with anything. The second reason I am pedantic is because in the fields I mention, and indeed in all fields of human existence, there are standards which, if observed, make life better for us as individuals, and for everyone else as well. Those standards we will call, for the sake of this article, ‘competencies’. We are all required to demonstrate a low level of competence when learning to control a ton of metal at speed, and immediately after passing our tests we lower that standard. We are all well aware that the law and scientists tell us that using a mobile while driving is dangerous, yet so many of us selfishly carry on doing it, attacking those who point out our stupidity. We are all taught in school how to use apostrophes, yet even those eminently capable of understanding the simple rules for their use consistently fail to apply that knowledge. Not to mention the equally simple different uses of your, you’re, there, their, and they’re. And if I read an ‘intelligent person’ has written ‘should of’ I weep. It’s about Standards, reader. Not moral standards – that’s a whole other topic – but about a willingness to at least try and be the best we can be; in the way we eat, drive, speak, write, work, think, learn, and so on. And to stop making excuses about it not mattering when someone points it out. If you want to make excuses about standards, maybe your brake mechanic will be okay to do the same, sometime. All proper service is self service. ≈ Comments Off on All proper service is self service. 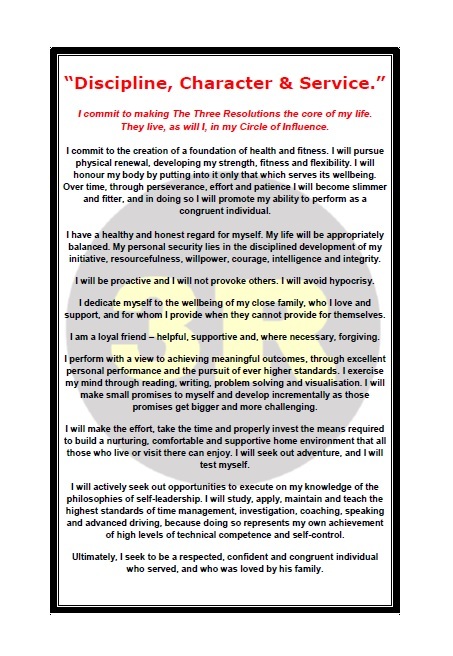 The ‘imposition’ of compliance with all of the Three Resolutions is that having achieved higher levels of self-discipline, competence and character, we should use the benefits of that achievement by serving others. Otherwise, we have not achieved, or at least achieved enough; nor are we living ethically. Note that the Third Resolution does NOT state, either explicitly nor implicitly, that the only kind of service one should provide is selfless, charitable or sacrificial. Only that the talents and resources serve others. We do that every day when we go to work and exercise our competence to the benefit of our employer and clients. We do it when we enjoy doing something for expenses only, as well as when we do things for free. The focus of the Third Resolution is on the provision of service, freely given or paid. So there is no need to feel angst when we don’t give money or time to charity, providing we give our time with the objective of making other peoples’ lives better. At the same time, compliance with the Third Resolution does not prevent you providing free, charitable, selfless service to others! Giving your time and competency for free in the service of others is, arguably, enough. Let others focus their efforts on collecting cash if that is their strength. Play to your own. Teach, role model, give your time – whatever you can do to serve, don’t feel obliged to comply with someone else’s expectations or impositions. Do so because, as Emerson suggests, you become better and feel more compete when you do so. For example, I have just started a process to teach/mentor drivers in advanced driving technique. My objective is improved driving standards, not road safety – although the latter will be served by the former. Doing this serves me as much as it serves my future trainees because that task reminds me of my own need to be a better driver, to maintain a high standard and keep on learning so that my teaching improves. I get better attitudinally and technically, as I help others do the same. Emerson was right. Serve your own way – in a way that is a reflection of your Mission Statement. But serve. This week, decide what you have to offer that would benefit others through a charitable (free) route, or just revisit your attitude towards the paid work you do and see if you can improve it. Join a professional association, a charity – anything! For more on The Third Resolution, go to Amazon. ≈ Comments Off on A Parable. He stood tall, as his name suggested. Tall-as-a-Tree, respected Sioux warrior, looked out across the plain and took in the air. Conflict was all he could smell. As his forefathers had themselves found, life on the prairie was filled with dangers – many natural like the stormy rain and floods, but others more sinister in the form of Man. And it was Man he could detect on the wind. Tall-as-a Tree feared no man. Born to a noble family, brought up with wise mentors and physically strong peers, and ultimately carved and weathered by his environment, he was able in combat and sage in judgement. If talking was needed, he could debate with any man. If force was necessary, he was of powerful build and tone. His life was rooted in the lessons of his ancestors both recent and from long ago – hundreds of years of knowledge and experience had been imparted to him, and he had learned his lessons enthusiastically. He had prepared for and easily passed every physical test he was expected to undergo as part of his duties as a warrior; his intellectual capacities in negotiation were well known. His training had begun when he was barely able to walk and he had mastered the knife, bow and tomahawk. His hunting prowess was known throughout the land. He could hit anything he aimed at and he frequently fed other families with his kills when his own family had enough. He was rich in tribal terms but he was also generous and compassionate. At the appropriate age and time he took a wife. As the greatest warrior in the tribe he was able to choose her, and she was acknowledged by all to be the most beautiful girl in the village. The celebration was held and happiness reigned throughout when they told everyone that his bride was to have a child; the joy was immeasurably enhanced when a son came to them. In what seemed like no time at all she fell pregnant again. And he found a lover. A young female from a neighbouring tribe married into their own and she was also beautiful. There was something different and magical and unattainable about her when compared to his own bride, the mother of his children, and he was enamoured. On the night when others were engaged in celebration of his wife’s second pregnancy, they consummated their illicit love, thus betraying his wife and her husband. Shortly after the birth of his second child, a daughter, there came a time of war. And it was now, as he smelled the air and smelled man that he knew the time had come for a reckoning. In battle there was no guarantee that the greatest warriors would live. Combat with an individual caused him no concern because he was prepared for such a trial. But a stray arrow, overwhelming odds, a fallen horse – anything like that, outside his control or even his awareness, could be the cause of his death. But his heightened awareness, bred through skill and experience, lessened that likelihood, and with this he was content. It is said that a man sees his life pass before his eyes at the moment of death. Whether it is true of a man that he reviews his life as he prepares for the possibility of death, such as during preparation for battle, is not so clear. But when Tall-as-a-Tree considered his life, his actions and his betrayal, he was suddenly gripped by enormous regret, even guilt. He was seen by his peers as the ultimate male, the one up to whom all men looked for example. And he had failed them, he had compromised his values and he had broken unwritten yet sacred laws that he knew, that they all knew, to be true. The respect in which he was held he also knew was based on a false premise – that he was a good man. He knew he was not. And that ate at him at this crucial moment. As he rode into battle he doubted himself……..
Do you ever feel like that? If so, accept your flawed action, confess it if you feel it appropriate, then move on with greater dedication to observance of character.